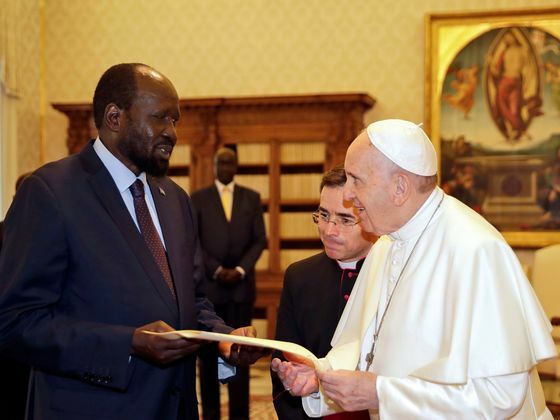 (Bloomberg) -- South Sudanese President Salva Kiir asked Pope Francis to help raise funds needed to implement a peace deal that’s aimed at ending five years of civil war. Kiir appealed to the pope to urge the U.S., U.K. and Norway to “support the peace agreement materially,” Minister in the Office of the President Mayiik Ayii Deng told reporters in South Sudan’s capital, Juba, on Sunday. Kiir and Pope Francis held talks at the Vatican on Saturday. South Sudan said it needs to raise $285 million to support implementation of the peace agreement. South Sudan’s warring sides signed an accord in September to end fighting that erupted in December 2013. About 400,000 people have died and 4 million others have been displaced by the conflict, which also more than halved the country’s oil production. The talks between Kiir and the pope sought to bring “a definitive solution” to the conflict and help refugees and internally displaced people return to their homes, the Vatican said on its website. The pope is considering a visit to the East African nation, according to the statement.